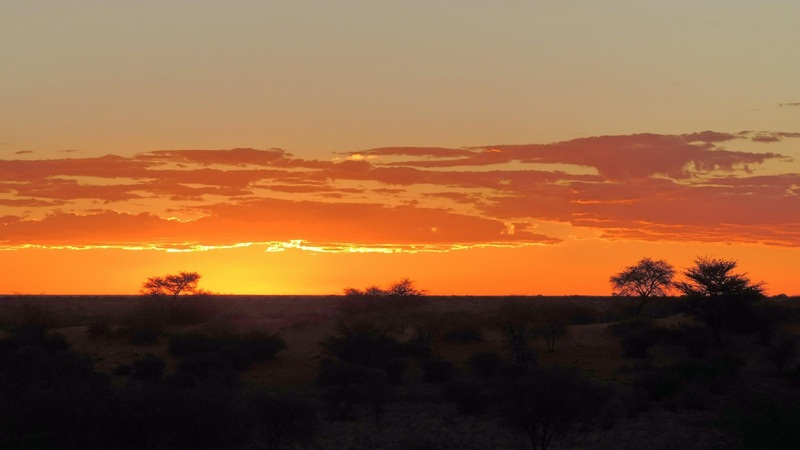 This is our last review of the Gondwana Collection of Namibia lodges. We'll do one more post at some point over the next little while detailing our "best of" those lodges! 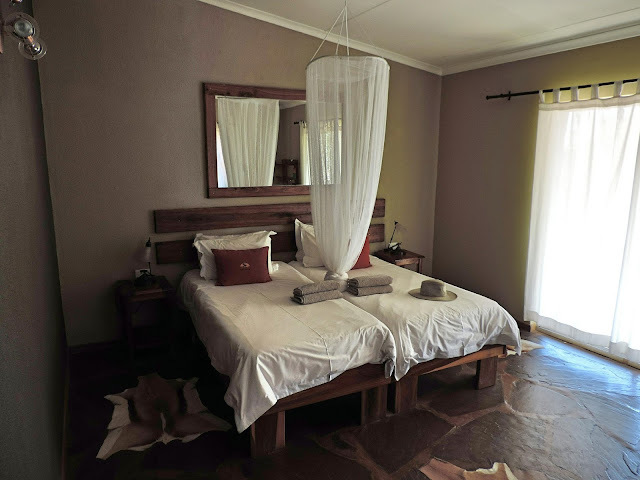 But for now, let's have a look at the Kalahari Anib Lodge. This lodge is the closest one to the capital City of Windhoek, and so it's a common location for people either beginning or ending their Namibia adventure. But it also has a huge game viewing property, with trails so that you can walk amongst the zebras and ostriches and other wildlife! Loved the guard at the entrance. He remembered us because we had been camping here in November, and then a couple of weeks ago we had dropped off a hitchhiker who happened to work at this lodge. Then of course we were back again this time. He was funny, and couldn't thank us enough for coming back. Sorry we didn't get his name. At the reception, there was a glass of cold fruit juice waiting for us. And then there was a glass of sherry waiting for us in our room. Our room was simple, but comfortable. We actually had to ask for a different room though. While there was nothing wrong with the one we were given, it faced west and into the hot afternoon sun. Even with the aircon on full, it had a hard time keeping the room comfortable, and you couldn't sit on your patio at that time of day. There are a couple of friendly pups on the property. This is Zoe, and she was a sweetheart. It was fun getting our dog fix! 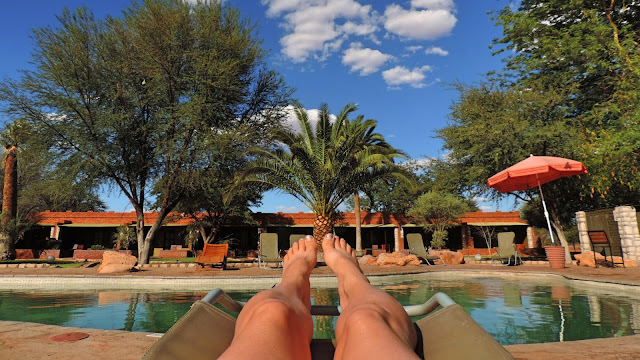 There's a nice swimming pool at Kalahari Anib Lodge, but there's a definite lack of shade around the pool. Maybe an idea to invest in a few more umbrellas. Maybe it's the time of year, but there were a lot of mosquitoes at this property. They do have netting in the rooms though, as well as bug spray. The food was fine, but nothing special. We did have the chicken salad for lunch, and while it was good, it wasn't quite as good as the one we had at the Damara Mopane Lodge. And for whatever reason, the chicken salad at Damara Mopane was N$65, while the one at Kalahari Anib was N$95. We had a beef stroganoff for dinner, and while it was okay, the rice that was served with it was literally cold. Hopefully that one meal was just an anomaly because it wasn't up to the Gondwana standard in our opinion. They do a worthwhile game drive here though. The sundowner drive was great, and our guide Jason had a good sense of humor. Sunset at the Kalahari Desert. Love the sunset. Just exactly how I picture Africa. Yep, they sure do have some stunning sunsets here! Beautiful location, sunset, relaxation - Mmmmmm. Happy New Year Kevin and Ruth. Pretty much perfect, isn't it?! Happy New Year to you too Mary-Pat. Really nice looking rooms but the mosquitoes would drive me crazy. They just love me. You have taken some really incredible pictures. Luckily they only bothered us when we were sitting in the bar area. They didn't bother us in bed at night but it also helped to have the mosquito netting.